The Senate is now processing applications for news media credentials for the 86th Legislature (2019-2020). A media credential application must be approved before a media member may be admitted to the floor of the Senate while the Senate is in session. All applications are subject to review by the Secretary of the Senate's office. Please note that media credential applications may require several days to process. Therefore the Senate is not able to issue media credentials on the date of application. An applicant for news media credentials must complete and submit a notarized Media Credential Application form along with a letter (example letter) on letterhead from the editor, publisher, bureau chief, or supervisor of the sponsoring news organization. The letter must certify that the applicant is engaged primarily in reporting the sessions of the legislature and that no part of the applicant's salary for legislative coverage is paid by any source other than the sponsoring news organization. Applicants not seeking media credentials for the entire 2019-2020 period may apply for a One-Day Pass. A One-Day Pass is only valid and recognized for the specific issue date. The applicant must indicate in Section 2 of the Media Credential Application that the applicant is applying for a One-Day Pass. You must indicate on the application the date for which you want the One-Day Pass. Upon a determination that the application is complete and verification of employment, the applicant will be notified by e-mail to report to the Senate's Human Resources department to have his/her photograph taken. Senate Human Resources is located in Suite 625 of the Sam Houston State Office Building located at 201 E. 14th Street, Austin, Texas, 78701 (the northeast corner of the Capitol Complex). 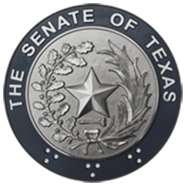 You may contact the Secretary of the Senate's office at (512) 463-0100 for additional information or inquiries regarding this process, or you may send an e-mail to secretaryofsenate.office@senate.texas.gov. Senate rules pertaining to the media are found in Senate Rules, Article II, Rules 2.02, 2.03, 2.04, 2.05. The issuance of news media credentials does not constitute a determination of your qualifications for any other purpose. The Senate reserves the right to investigate the information provided in the application and to deny or revoke news media credentials if the Senate determines the applicant does not qualify. The news media credentials should be worn and be visible at all times to gain entrance to the Senate Floor when lawmakers are in session. The news media credential card does not exempt the media from entering the Capitol without going through security. Senate rules are strictly enforced and apply to everyone with access to the Senate Floor. Media credentials are not required to monitor Senate Floor proceedings from the Senate Gallery. The Senate strongly encourages members of the media to apply for news media credentials as soon as possible in order to help expedite the process. All applications will be processed on a first-come, first-serve basis. Applications submitted on the first day of session will not be able to be processed on the same day. Please note, the Senate does not provide notary services.